The master record cutting lathe moves in a straight line. Obviously the best method of recovering the groove information is to mimic the recording lathe. Most tangent tracking tonearms (linear tonearms) are pivoting arms on a moving sled. They move the attachment point with a motor. They play catch up, produceing a series of arcs across the record instead of a stright line. This is not the best method to accomplishment. A non-motorized true tangent tracking tonearm is expensive and extremely fussy. The reason older turntables (also today's less expensive) use 9 inch arms is: the overall size grows thus the cost and the turntable may not fit the average component rack. The 12 inch radial arm is 3 inches longer than the 9 inch. This difference as shown in the diagram above, relates to about 25% less tracking distortion. It may look like a small amount. But when dealing in microns it is huge. The longer the arm the shallower the arc. The shallower the arc, the lower the angular error, and hence less distortion. One difference is the 12 inch arm's moment of inertia is only slightly higher due to extra length of the arm tube. However, the arm tube material is extremely light. The effective mass of the 12 inch is very close to the 9 inch arm. The reason is effective mass is derived by a complicated equation that uses mass and inertia. One overlooked aspect of 9 versus 12 the effect of the 12 inch arms shallower offset angle creating less skateing force. 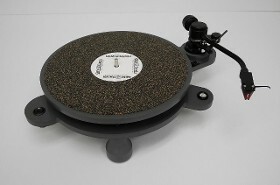 If your turntable will accept a 12 inch arm the performance difference will be very apparent. When you are ready to move to a 12 inch arm look at the PolyTable SUPER12 or the Merrill-Williams 101.3. Both tables are compact and will fit virtually any stand.